I am sorry, but so far only the kanji are loaded to the page. I am working on creating the remaining material as soon as possible. What do you need most urgently? Mr. Nicholas here we are requesting you to fulfill our requirements we want N4 study material ,please upload as soon as possible…. hope you will..
Where can I get the grammar part for N4? Could you upload the list of verbs? Nice and really convenient site ! hi really thanx for uploading..
but these are not opening..?? Hi Nicolas! I am still waiting for the results of my JLPT N5 test (coming this March). At the moment, I am preparing myself with N4 (and browsing some N3 references). I am looking forward to see more of your materials with N4. You really helped me a lot with my N5 test. If you fail to help love but simply with distaste, it is better that you can leave your projects. Happiness doesn’t result from doing easy work but through the afterglow of satisfaction that comes after the achievement of a struggle that demanded good. It is June yet you still have not updated your website! We are sorry for the long waiting time, indeed we need lots of time to do this since it is lots of work we will try to complete it as fast as possible. Thank you so much for this. This site is so helpful! i cleared the jlpt n5 after studyin from this site .. in 2 days .. i know thats impossible but i watch a lotta japanese anime so that helped too … all the questions where within the syllabus rovided in this site .. so im rooting for this site …. waiting for the complete n4 material to come out. Hi, can 1 of ur admin contact me pls? I’ll share with u the grammar list that i have created then u guys can modify it. Can i get the material of chokai N4 here? I need it most urgently. We do not have material for Chokai test yet, sorry. I need study material. I will be heartily thankful if you can provide me this material. Hope that you will help me out of this. I’m really impressed with the website as it’s convenient!! I note that the i-adjectives, the na-adjectives and the verbs are listed separately. I feel it would be even more comfortable if nouns are also listed separately. Hi, thanks for sharing this good idea. We will add it as soon as we find some time to do so. This website is really too good. I like the way it is organized. Could you please update grammar for N4? I will be taking the exam in December 2013. Hello! Thanks for this amazing website! I appreciate the time and effort you put into building the site, organizing and uploading the material! It appears the N4 grammar points will not be added. If anyone has any suggested websites with this information, it’d be greatly appreciated! Guyes wt a great work. I passed n5. And looking for complete stuff regarding n4. Plz plz upload rest of the n4 stuff as soon as u can. I m gonna take n4 at dec 2014. Looking forward. Domo arigato to in advance. Thanks a lot for this extremely helpful website. You have to put in great efforts to create this whole content. I appreciate it. Im taking N4 next month… im not sure where can I get a good material for revision. If anyone of you will be able to point it out. i will be really greatful. Hello Sir,Thanks a lot for updating this useful materials.Well can you please tell me,where I could get all Japanese kanji pdf ( say from N5 to N2) in the form of pictographix / picture mnemonics.I need it urgently. 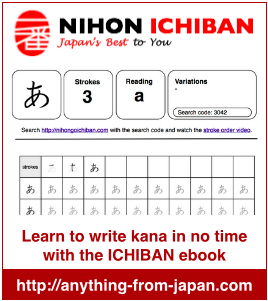 I have been referring to this useful website ever since I started learning Japanese.. I wrote N5 in July and planning to write N4 in Dec… I am referring to Minna no nihongo II .. is that fine? Also Can anyone please tell me how many chapters of MNN II should I cover for N4.. Please help….